Hello my friends! I hope you are all doing well! It has been a busy week here, as my hubby had cataract surgery yesterday, and today we were back down to the city for the follow up exams, etc. All went very well and he is very happy to be seeing so well! Now he's already wanting to get the other eye done as it's made him realize how even what was his "good" eye now is his "bad" eye. LOL! Isn't it amazing what can be done these days!!! The procedure has been improved so much over what it used to be and we are so thankful!!! Anyhoo... 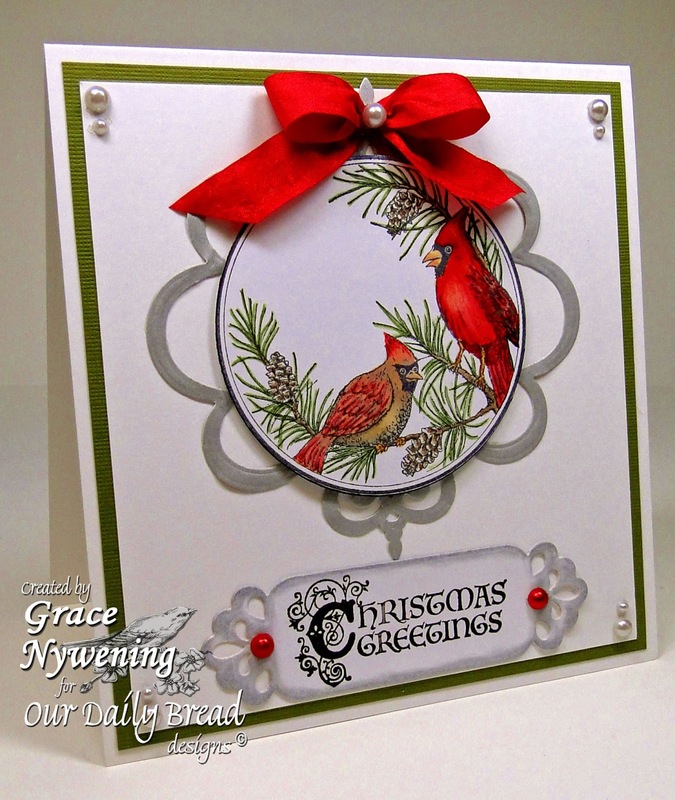 I wanted to share another card I made with this month's fantastic sets from Our Daily Bread designs. 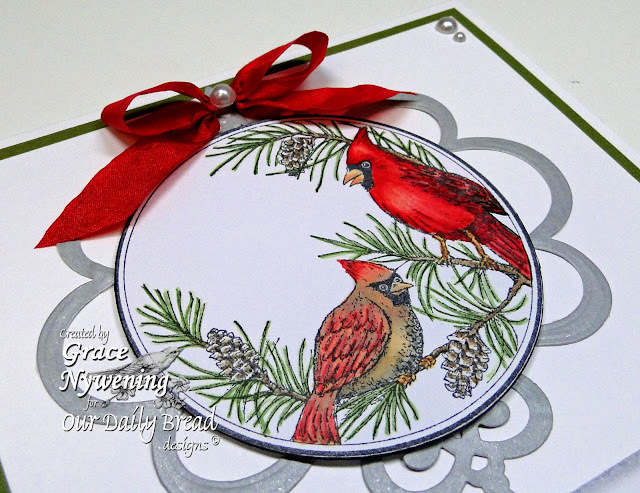 I used Cardinal Ornament for my image, and Christmas Flourished Verses for the sentiment. The image is cut with Spellbinders Classic Circle Large, and is framed with Spellbinders Ornate Artisan Tags & Accents. The sentiment is cut with Spellbinders Fancy Framed Tags Two. Istamped with Memento Ink, colored the image with Copics, and sponged the sentiment panel with Brilliance Silver Ink. The ribbon is May Arts (from my stash) and the bling is from my stash. I really am enjoying playing with these sets!!! I hope you have a great rest of the week!!! Gorgeous card, Grace! Glad to hear DH's eye surgery went well! It is amazing what can be done these days! Big hugs to you! Your card is so clean and elegant! Love how you made a Christmas bauble styled frame for your image - fab coloring! Simply elegant and ever so beautiful. Beautiful Grace, and so glad to hear that the cataract surgery went so very well. So beautiful Grace, the colors are gorgeous.Fabulous design too. Lovely card, the coloring is fantastic, pretty framing! What a lovely card - I love the flash of red! Thank you for joining us at Crafty Cardmakers. Beautiful card your colouring is wonderful, thanks for joining us at Crafty Sentiments this week. Hello Grace wow this is fabulous. Grace, this is just gorgeous!! I love all your touches of silver accents! So happy to hear of your husband's successful surgery...what a blessing! So pretty! Love that image! It looks wonderful on this card! Thanks for joining us for the Clear It Out "Use your red stash" challenge! What a lovely card. So stunning design. I like the colors you have used and love the CAS style design like Plastic cards which make the card POP. Thanks for sharing. A fabulous card, I love the image. Thank you for joining us at Craft-Room Challlenge. Thank you for playing with us at Stampavie and more.